It was announced here, February 19 on ExtDesenv, the pre-sale of Ext Designer, the visual editor for Ext JS. From there began an intense discussion whether it is worth purchasing the product or not. This post is a bit of my point of view and also comments from the community about it, go ahead! Few know but there is an official blog post providing more information and downloadable trial version of the software. In this version you can only create the screens and make prints. You can’t save any work or export the generated code. In addition there are videos showing the use of the editor. All these features are enough to give an idea of what is the designer. Do not handle code, just drag and configure the components on a more intuitive way as possible. This is very positive, since we can create interfaces much more quickly than by code. People with the slightest knowledge of Ext JS can still benefit from the option of creating prototypes, which can then be improved by an Ext programmer. 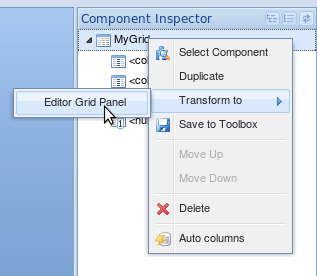 It is possible to integrate your XML or JSON data source with Ext Designer, to see your grid and other components being populated with data. Further increases productivity and creates a clear separation between data and interface. You can have a developer involved only on the server side, creating the data sources, and another in parallel creating interfaces. At the end of the work everything is attached by Ext Designer. 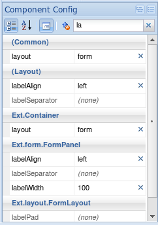 Export object-oriented code directly into the IDE of your choice. According to Jack Slocum “the code is worthy to be considered as written by himself”, but if you don’t like it you have the option to export and modify it in an IDE. The hardest part has been done, which is the creation and configuration of components. As mentioned, people with minimal knowledge of Ext can prototype screens and then take screenshots. Impress your client building an interface in front of him. And much more like saving pre-defined components for reuse, and undo and restore feature. These resources are exciting enough, but it’s enough to do a pre-sale? Q: Will it be possible to import existing projects? A: Not for the initial release. Q: What are your pricing plans for updates? Do you get updates for free? A: Initially we had thoughts of an annual fee, but decided to scrap that based on community feedback.The designer is a perpetual license. This means you buy it once without any obligations to upgrade annually.We will also be providing free updates and enhancements for the designer until we announce our next version (just like ext 2 -> ext 3). Q: Will it be possible to add support for custom components like extensions and plugins? A: Yes. We built the designer with community extensions and the developers that support them in mind.We will be announcing more on this in the coming months. Q: Will there be an evaluation version of the latest release of the product? Would be nice to gen and experiment code before actually purchasing. A: We plan on offering a trial after we release the product.The limited time, 50% off promotion is following the tradition we started with version 1.x of Ext JS. Q:How can I convince, for example, my boss to do Ext Designer pre-sale without any assurance that it will improve productivity? A: The pre-order is heavily geared towards our community that do not require any formal approval processes. We are working on a trial, but it won’t be available until after the pre-order sale is over. Q: When will be the official release? A: We’re planning doing it at end of march, next to day 21. Q: What are the advantages using Ext Designer? Using Ext Designer as a productivity tool will save you time and improve your deliverables. It’s not intended to replace any aspect of your existing workflow, just improve it.As an example, we envision contractors spending their time with clients more productively by building interfaces in real time. The Ext Designer will also empower end users to participate in the planning and maintenance of applications, allowing you to focus on building applications faster. The Designer is IDE independent, as such, the code generation can output to a directory of your choosing where you and your favorite editor take over. At the end of the day, the Designer will bring a refined experience to our community, customers, and end users. I consider myself one of those community programmers that need formal approval to make purchases like this. However only to see the product demo, videos, and comments by the development team I am convinced (and my bosses) that this will be the tool that will improve the entire process of creating interfaces. Analysts may prototypes and save their work. When I starting working on the project it will already have the prototype attached and I can take care on improving the code both through the designer, and after giving final touches to the code with an IDE. Our licenses have been acquired, and we are excited waiting for the final release. Congratulations team Ext JS for the great work. Releases like this only confirm the confidence by the community in your work. Meu ponto de vista é que a pessoa fica tão bitolada com drag-drop, geradores de código, etc…Quando surgir um imprevisto que a IDE não atende, daí começam os problemas. Acho que os posts antigos deste blog de como organizar os arquivos por herança de componente, carregar arquivos em demanda, já é mais que o suficiente pra alguem ter sucesso com a ExtJs. Se bem que isso é minha opinião, talvez muitos não concordem. p.s. falando em antigos posts, preciso atualizá-los =/ tempo? cadê? Eu acho assim, vc q ja possui certa expêriencia com a Ext, faz todo o sentido pegar uma ferramenta que agilize o trabalho, pq realmente depois que vc pega o jeito de montar telas, fica realmente bem entediante o trabalho e muito propenso a erros. Me adiciona no MSN se quiser. A ferramente parece ser legal. Porém concordo com o comentário do Samir e acrescento. Vocês já viram a quantidade de lixo que ele gera ? De código sujo ? Para cada tela ele gera uns 5, 6 arquivos por baixo, quando na verdade vc só precisaria de um arquivo js, um php ou html e um json. Ele gerá vários arquivos com o js, separando tudo. Fica uma bagunça, deixa carregado.